How do I look after my Denture? Give them a break Take your dentures out before going to bed. The mouth tissues can recover from wearing them during the day. If taking your dentures out at night is not an option for you, then be sure to remove them for six to eight hours at another time of day. 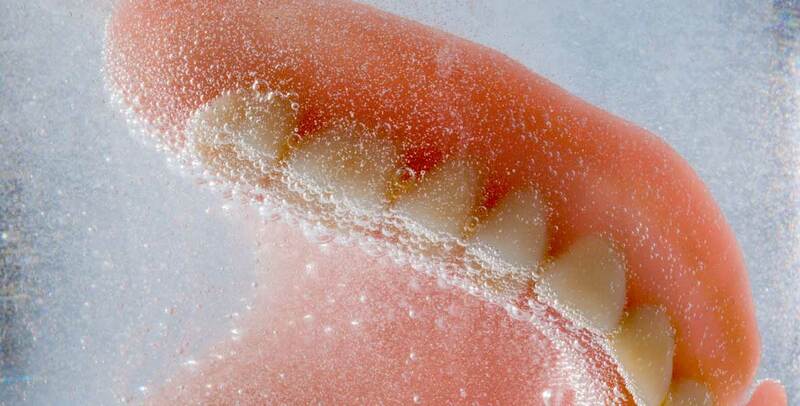 Soak your dentures in warm water if they have metal clasps. If they don’t, you can use either a half-vinegar, half-water solution or a special denture cleanser. Soaking will help to remove stains, plaque, tartar and bacteria. Handle them with care Your Dentures are an costly investment. And since they can break easily, you’ll want to be careful with them. Clean them over a folded towel or bowl of water in case they drop. Don’t use toothpicks when you’re wearing them, and don’t use strong cleaners or hard brushes to clean them. All of these can cause damage to your dentures. And never leave them where young children or pets can reach them. If you happen to be in a hospital for a brief stay or in Nursing Home or other Care Facility be sure to store your dentures in an airtight container so that they are not accidentally thrown away which unfortunately happens quite often. Clean them daily Just because these aren’t your real teeth, that doesn’t mean they don’t need regular cleaning. There can still be a build up of stains, tartar, and bacteria, If your dentures are plagued with plaque, it can lead to problems in the tissues underneath, such as infection and irritation. Brush your dentures with a regular soft-bristled brush (not the same one you use for your real teeth). You can also use a special denture cleaning brush. Clean your dentures twice a day with either a mild abrasive toothpaste and dental paste and soak them in water using soaking tablets which are all good choices for cleaning dentures and can be found at your local Chemist or Supermarket. Look after your whole mouth Even if you have complete dentures, you still need to care for your gums. Whenever you take out your dentures, give your mouth a good rinse and then massage your gums with a washcloth or a soft toothbrush. If you have partial dentures, you still need to properly brush and floss your regular teeth every day. See your dentist Whether you have partial or complete dentures, you still need to see your dentist at least once a year. The dentist will examine your oral tissues for changes and for sores that might become cancerous, Your Dental Prosthetist will also provide advice as to oral hygiene and denture care. Watch for changes in fit If your dentures are ill-fitting or don’t feel right, check in with your Dental Prosthetist. The gums and bones in our mouths change over time, which can lead to an improper denture fit. Poorly fitting dentures can cause problems like sores, pain and burning. They can even cause abdominal gas from swallowing air. Your Dental Prosthetist can adjust your dentures. Dentures that don’t fit can also be a sign of periodontal disease so it’s important to get checked. Nourish the rest of your body Since dentures may make it difficult or even painful to bite and chew fresh fruits and vegetables, there’s a risk you’re missing out on essential nutrients so make sure you’re eating a well-balanced diet. Research suggests that proper nutrition slows the progress of gum disease, so a healthier diet could even mean a healthier mouth. What are the Benefits of Replacing Missing Teeth With Dentures? Why do I need a Denture Examination?